Is your microphone is not correctly picking up sound for recording? Perhaps no-one can hear you on Skype or voice recognition is not optimal? 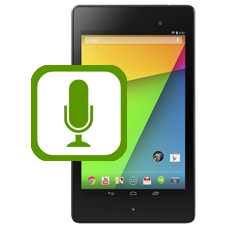 If so we can replace the faulty microphone with a brand new one, restoring your sound recording capabilities on your Nexus 7 2013 edition. This is an in-house Nexus 7 microphone repair service, when ordering this service you are required to ship the tablet into our repair centre for works to be undertaken.